According to the latest CNN report, the flooding is affecting about 1/3 of the country. The extent and the duration are extraordinary. See today’s report in CNN. An interesting secondary effort is that the manufacturing interruptions in Thailand are causing economic problems for Japan. Japan’s supply chain is once again affected, this time by a disaster outside of its national boundaries. See this Wall St. Journal article on Oct. 27. 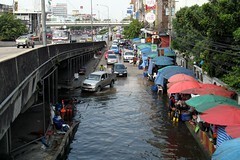 This entry was posted in Floods, Thailand by recoverydiva. Bookmark the permalink.